Chute Lodge stands in Chute Forest, near Andover, Hampshire. It is a Grade I listed building. A house called Chute Lodge was standing in 1632 and was lived in by Sir John Collins M.P. (1624-1711) in 1650; a chapel was consecrated in it in 1674. It was replaced by a new Chute Lodge, built on or near its site in about 1768 for John Freeman to designs by Sir Robert Taylor. 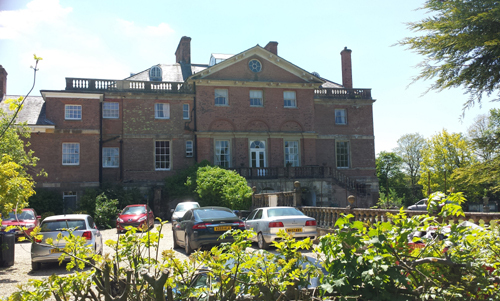 The new house was one of several compact country houses designed by Taylor in the 1760s for men who were connected with the East India Company. The house was built of red brick in header bond with stone dressings, as a rectangle of seven bays by five. It has a tall basement faced in rusticated stone, a piano nobile, and, except above the north-east and north-west corner bays, an attic storey crowned with a wide bracketed cornice. The north front, of five bays, the centre 3 broken forward and pedimented, incorporates the main entrance. This was reached by a pair of curved flights of steps in the central bay of the piano nobile. On each of the other three fronts there was a canted bay, that on the south being of full height, those on the east and west of two storeys. The piano nobile on the north front has 3 shallow arches with continuous stone cornice and moulded stone architraves. The central opening has a pair of doors and flanking 12-paned sashes. Six-paned sashes to upper floor. Wide timber pediment with paired modillions and roundel to attics. Bays 1 and 5 have later eaves balustrade, and added small windows in bay 1. 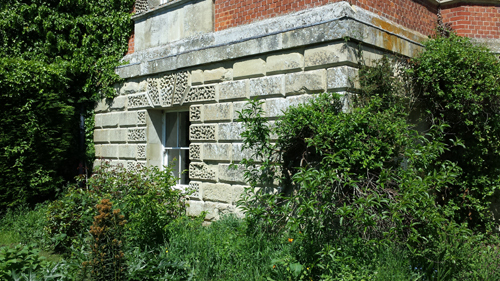 The garden elevation (south) has central 3 bays canted for full height, the main windows having architraves with alternating vermiculated rusticated quoins in the Gibbs manner, rounded heads and flat aprons below. There are pairs of doors to the basement level with emphasised rusticated voussoirs. The eaves have paired modillions. There are three early twentieth century tripartite dormers, sashed, with centre light arched. It has symmetrical stacks. The side elevations are similar but have canted central sections to the basement and piano nobile only and the roof hipped. Inside the house the piano nobile has a hall, an octagonal saloon, a dining room, and a library around an oval staircase leading to the attic storey and lit from above. The library, central to the west front, has a segmental headed apse with delicate neoclassical plasterwork. Chimney pieces, and doorcases survive. The only access from the piano nobile to the basement was a staircase in the north-west angle of the house. The kitchen, below the dining room, is a double-height room sunk into a sub-basement. 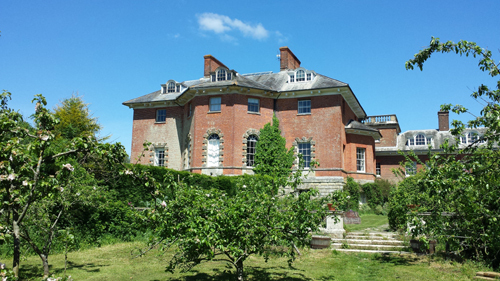 In the nineteenth century the north front of the house was altered: the two corner bays were raised by an attic storey, and a level stone balustrade was added to each; the flights of steps to the entrance were replaced by a terrace connected to the ground by a straight flight of steps at each end. The alterations may have been those made to the house in 1866 to designs by J. L. Pearson. The house was greatly enlarged in the period 1906-8 by the construction of new bedrooms in the roof, in which dormer windows were made, and by the building of an east wing. The wing, on an L plan, is almost as large as, and was built in a style and with materials sympathetic to, the original house but without window dressings. In the mid twentieth century the house, especially the wing, was altered for use as a Borstal institution and afterwards as a school. By the early 1980s it had been divided into five flats and is now split into two. This was a job that came to nothing. I don’t usually write up houses in which I have not worked but I do so here for two reasons. The first is that I feel sure that it would have been a house known by my nineteenth century ancestors, the Bevans, who lived at nearby Fosbury House. The Bevans and the Fowles (of Chute Lodge) had adjoining estates throughout the whole of that century before selling up within a few years of each other. My second reason is that it there is a strong connection with another project that I carried out at Fawley Court, near Henley-on-Thames. John [Cooke] Freeman had been bequeathed Fawley in 1707 by his uncle Captain William Freeman on condition that he assume the name of Freeman. He married Susanna Sambrooke, hence his son was named Sambrooke Freeman. In 1768 Sambrooke acquired the manors of Henley and Phyllis Court together with Henley Park, the year that his brother John built Chute Lodge, Hampshire, to the designs by Sir Robert Taylor with some interventions by Sambrooke himself, for a drawing of a canted bow is inscribed by him ‘J Freems Room at Chute 1768’. I’m intrigued that you have pictures of my house – and my cars! – on your website and the one or two items you seem to’ve uncovered that I did not know. But I’m intrigued too by your dating of the east wing, which wasn’t all built in that period but between 1890 and 1906, as far as I know. There are at least three different periods of brickwork… I’d be interested to know, though, where you found the information you have. Equally, the ‘flats’ number four, not five, and I’m mystified by the “now split Into two” – who told you that? Last time I visited this house with some Old Boys of Staddles Prep school back in the early 90s’s, the house was split into two separate dwellings. And it has to be said the part of the house on the east side was a mess. The basement room at the back accessed by a short staircase that in days when it was a Prep school was used for morning assembly had its floor cover in dog poo. Always wish we had seen the west part that has the spiral staircase. Chute Lodge was the house I lived in from birth to the age of 4 (from 1974 to 1977/8 ish). The East Wing was unused but we lived in the west part and I have vague memories of the spiral staircase.